View the pattern teaser video on YouTube! 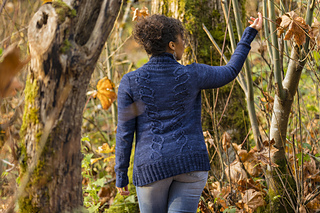 The cardigan version of Sevrine features a shawl collar, rounded front edges, and mirrored motifs that form a flattering hourglass shape against a reverse stockinette stitch background. The relaxed but feminine fit is timeless and wearable in a variety of settings. This cardigan is knit seamlessly from the top down with simultaneous set-in sleeves. 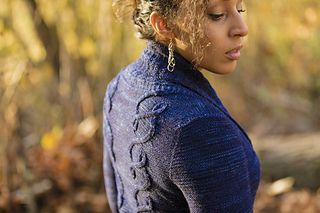 After establishing the back and fronts, you’ll pick up a small number of stitches for the sleeves before shaping the sleeve caps, yoke, and armholes at the same time. Once the sleeves are separated from the body, the tailored fit and silhouette are achieved through waist shaping, decreases, and short rows. 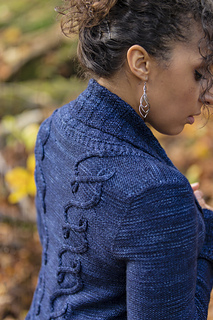 Stitches are picked up along the edges of the cardigan for the shawl collar and continuous edging. Upon completion of the body and edging, the sleeves are resumed from the underarm and worked seamlessly in the round from the top down. In a warmer climate? 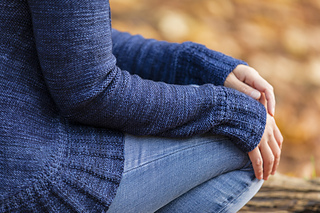 Instructions are also provided for short sleeves and a narrower edging to create a more vestlike cardigan that can be worn over a t-shirt or tank top. 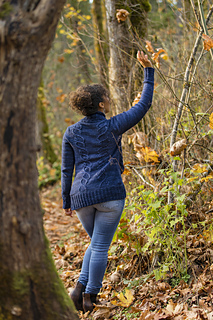 Long-sleeved cardigan with wider edging is intended to fit with approximately 2” (5 cm) negative ease when worn with edging overlapping (“closed”) and with approximately 4½” (11.5 cm) positive ease when worn open. Short-sleeved cardigan with narrower edging is intended to be worn open with no ease.